By the time Super Tuesday results are tallied, 11 states will have bound 595 delegates to the Republican National Convention in Cleveland. 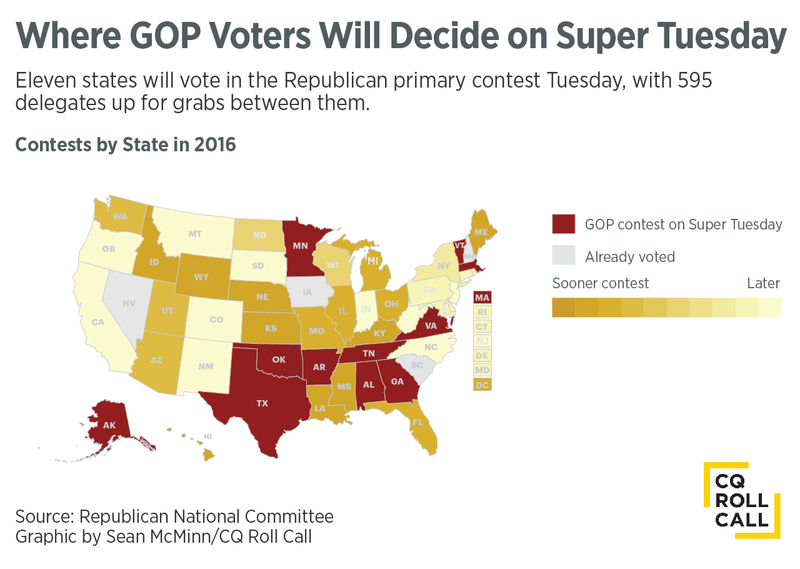 By the time Super Tuesday results are tallied, 11 states will have committed 595 delegates to particular candidates for the Republican National Convention in Cleveland — a large chunk of the 1,237 needed to win the party&apos;s presidential nomination. As Texas Republican Ted Cruz told reporters in San Antonio on Monday, “Super Tuesday, is, I believe, the most important day of this primary" — one he said could be an important day to slow Republican front-runner Donald Trump&apos;s momentum. Actually doing so would be a big feat. Trump, who already has the delegate advantage from victories in three of the four states that have already held contests, leads the polls in most states that vote on Tuesday, as well as nationally . The exception is Texas. After rallies elsewhere in the south over the weekend, Ted Cruz, the Lone Star State&apos;s first-term senator, spent the day on the campaign trail with former Gov. Rick Perry, one of the 12 candidates who have dropped out of the presidential race, and current Republican Texas Gov. Greg Abbott. In fact, Cruz&apos;s home turf — a state that sends 155 delegates to the Republican National Convention – might be the place to take some of the wind out from under Trump’s wings on Tuesday. Cruz has marshaled many of his resources to compete in the Super Tuesday contests, and while he trails Trump in the other states, according to the RealClearPolitics polling average , he has about a 10-point lead in his home state. The delegate heavy day kicks off a delegate heavy month for Republicans. By the end of March, the Republican National Committee says that 64 percent of the party’s delegates will be decided, with five of the 10 winner-take-all states on deck after March 15. Alabama, Alaska, Arkansas, Georgia, Massachusetts, Oklahoma, Tennessee, Texas, Vermont and Virginia will hold primaries on Tuesday. Minnesota will hold precinct caucuses. And while Wyoming Republicans will begin the process choosing delegates on Tuesday ahead of a state convention in April, they will send them to Cleveland unbound, meaning they can vote for whomever they like. With so many delegates on the line and fears from the party’s establishment about the unfettered rise of Trump, some Republicans have begun to coalesce around Rubio, who has attempted to give Trump a dose of his own rhetorical medicine. Rubio has thrown innuendo-laden barbs at Trump, from insulting the size of his hands to questioning whether his "pants were wet" after a tough debate. Rubio has gone for the more serious attack lines, too. He accused Trump of refusing to denounce David Duke, the former leader of the Ku Klux Klan who described a vote against Trump as "treason to your heritage." Trump blamed a bad earpiece during an interview for not being able to hear the question. Rubio added that Trump has been inconsistent on policies dear to conservatives. "It’s gone too far. It’s called a con job. 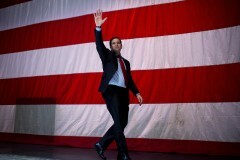 And we’re not going to allow a con artist to take control of the party of Lincoln and Reagan," he said . “When this process is finished, Donald Trump will not have the 1,237 delegates he needs to win, and I will be in this race as long as it takes to prevent that from happening, and to become the nominee,” he said . The Democratic contests on Tuesday — including a caucus in Colorado — will produce 1,004 of the 2,383 delegates a candidate needs to win the nomination. After a strong victory in South Carolina over Sen. Bernard Sanders of Vermont last weekend, former Secretary of State Hillary Clinton is expected to perform well in the Democratic contests.